The wait is no longer! You can shop Everyday & Co this morning! Wait, are you still here?... I definitely should have waited till the END of the post to link that. Ha! People are going to scoot out of this post faster than I can say $24 dress, but if you’re still here I shall ramble as usual! I am so excited about the launch of Everyday & Co. It’s everything I want a shop to be — affordable, easy styles, and hopefully something for everyone! I have literally been chomping at the bits to be able to wear some of these styles. 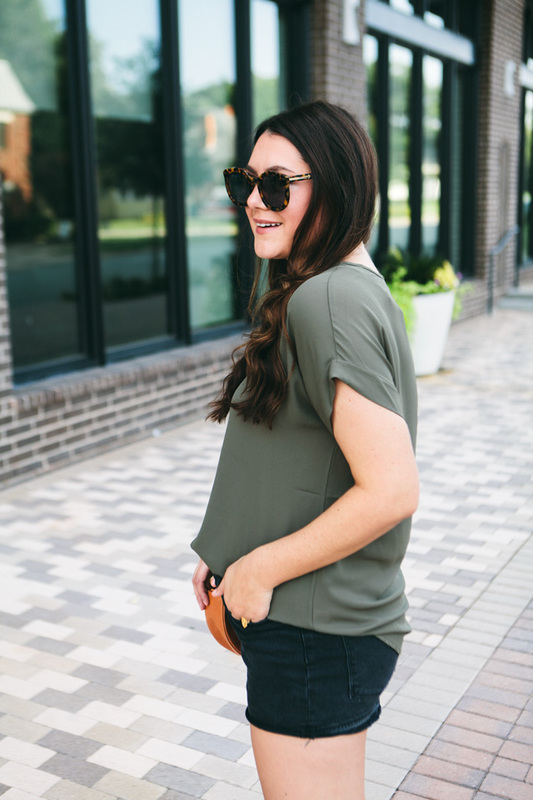 This top is one of my favorites, it’s the Everyday Essential Blouse. Basically, it’s a lightweight top that you can wear year-round with layers or without. You can dress it down, as I did here, or you can pair it with a pencil skirt or trousers for work. It literally goes with everything. You can find it here! I am in the medium, it fits true to size. A lot of you asked about size inclusivity and YES YES YES! We are just waiting on the inventory to get to us, but it is coming! My best guess is the week of Labor Day or the one right after, depending on shipping times! We will get more sizes and styles stocked from here on out! So stay tuned if you are looking for a different size and also let me know if you see a style you’d love to see restocked in your size! I will work all the magic I got. And of course, I’ll keep you updated! Thank you for being patient! Please restock the pocket dress in burgundy! I waited 44 minutes too long to shop and now its sold out! Let me just say…I LOVE the sleeve length on the tees!!! I like this relaxed look with the shorts! OMG yay I’m so excited for Everyday & Co. Loving what you are wearing and I can’t wait to shop some more haha! Love it all!!! Do you have any plans to do any maternity options? Because if so, I will buy ALL OF THEM. I love the shop! You have tees and dresses long enough for tall women (I’m 5′ 10″)! I’m pregnant now, but can’t wait to try some styles when after birth! I hope you can restock more of the everyday essential blouse. The smalls are out of stock. Love the selections so far. Woohoo, just bought two tops! Love this so much! So excited for Everday Co! I’m just curious – are you designing the items that you’re selling on Everyday & Co? Just wondering because I didn’t see any brand names other than Everyday & Co. It all looks great, congrats on the new venture! No, not designing. This is a boutique so we are selling pieces from third-party clothing lines! Please restock – my squad calls me momma, also the everyday essential blouse, which I’d also love to see in ivory! It’s amazing how hard it is to find something so simple and useful! I will on the My Squad tee! The Everyday Essential blouse is out of stock from my vendor but I will try my very best! 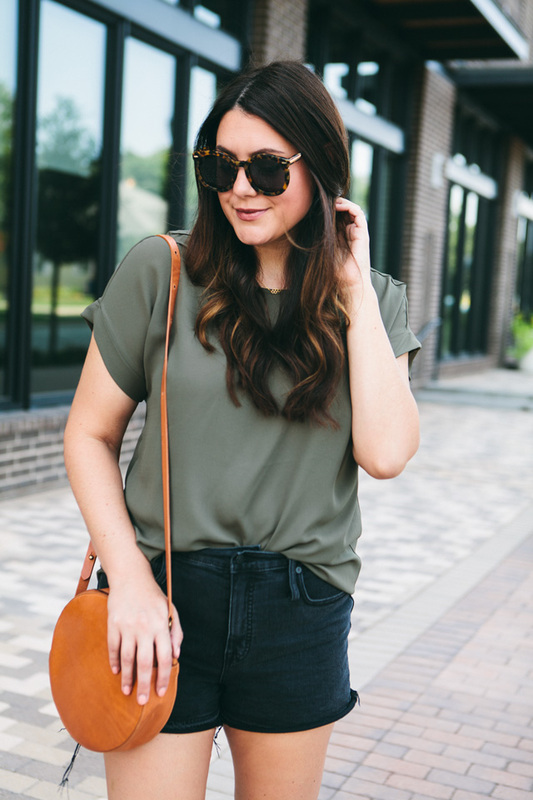 That green blouse is the perfect transitional piece for fall! Okay my sweet jumpsuit loving friend we have one I know for sure coming! I’ll let you know! It’s olive and would look perfect on you! Do you ship to Canada? I can see so many things I can wear to lecture in as well as use when home with the kids!